What’s up with the massive Google ad running across the top of the screen? Isn’t that where the website name and logo is meant to be? In fact, where is the website name and logo? Who built this website? Whoever it was should be fired. It’s awful. It looks half finished, and is so packed with advertisements, you can’t really make your way around the site at all. It’s hard to work out which part of the blue and white background is the site itself, and which is just another Google ad. 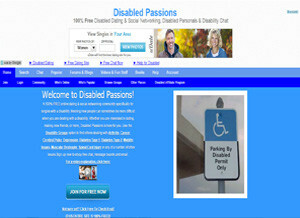 Too much DisabledPassions.com – too much! I didn’t bother to register for the site, I’m going to be honest. I had a look around and tried to find more information on the pricing and what services they had to offer but I got bored of trying to work it all out long before I even found what I was looking for. As I’ve mentioned before, I have pretty severe learning disabilities so the thought of making my way around the fussy, complicated, over-stuffed website was just too daunting. It says ‘THIS ENTIRE SITE IS 100% FREE!’, which would indicated it was actually 100% free. I couldn’t find any information on pricing, so I’m assuming there are no membership fees. I also imagine that explains why there are so many ads on the site – something’s gotta pay for the website hosting and other costs. This is why I would always go for a website that you need to pay a membership fee for. Free disabled dating websites tend to have many advertisements that hinder your browsing experience. I didn’t really delve too far into the website to seek out eligible disabled singles, but the home page showed a small selection what was on offer inside. Out of the 10 profiles running along the bottom of the home page, said to be users online now, three of them didn’t have profile pictures, and all minus one of them were a starred member. Considering the website is meant to be free, I wonder what this star membership is all about…? I’m going to be honest, if I were basic the entire selection of disabled singles on that one peek alone, I wouldn’t rate it very highly. *I didn’t bother taking a closer look / registering.